The no-reflow phenomenon after interventional or pharmacological reperfusion in acute myocardial infarction, a phenomenon variably defined over time, occurs in the absence of the mechanical obstruction of the epicardial artery involved in infarction through the deficit of perfusion at microcirculation level explaining the post-reperfusion myocytic lesion1-5. In ST-segment elevation myocardial infarction (STEMI), the persistence of the no-reflow phenomenon is involved in the evolution of the myocyte lesion to myocyte death with increase of the infarcted area and of the risk of major cardiovascular events6,7. After myocardial infarction, the no-reflow phenomenon is associated with an increased incidence of heart failure, arrhythmias, death on short, medium and long term6 and it is an independent predictor of mortality at 5 years8. The no-reflow phenomenon thus minimizes in STEMI patients the benefi ts of epicardial coronary artery recanalization obtained by primary angioplasty. Clinical studies that assessed the no-reflow phenomenon dynamics reported its reversibility with favourable prognostic impact at 1-6 and 12 months post infarction, by reducing 5-6 times the risk of death6. Identification of risk factors of the no-reflow phenomenon, its prophylaxis and therapy seem to be important goals of interventional reperfusion, which has to be extended from opening the coronary artery involved in the infarction to the optimization of the myocardial perfusion by obtaining and maintaining perfusion at microcirculation level9. The diagnosis of the no-reflow phenomenon after STEMI is a challenge in clinical practice and can be done after percutaneous coronary angioplasty (PCI), in the presence of the TIMI3 flow (Thrombolysis In Myocardial Infarction)13, through a coronary angiogram assessment of „TIMI frame count”1,11 and of the myocardial BLUSH grades (MBG)12, by assessing on the electrocardiogram(ECG) the reduction of the ST segment elevation after PCI14,15, by determining the coronary flow reserve using the intracoronary Doppler ultrasound and by evaluating the microvascular perfusion distribution via an intracoronary contrast echocardiography16,17. The non-invasive assessment of the no-reflow phenomenon with gadolinium-based magnetic resonance and positron emission tomography, evaluating the microvascular lesions and the infarction extension is expensive and has limited availability in clinical practice5,18,19. In this context, the diagnosis of the no-reflow phenomenon in patients with STEMI and primary PCI using the transthoracic Doppler echocardiography (TTDE) evaluation of the flow in the coronary artery involved in the infarction and the coronary flow reserve is easier, with a sensitivity and specifi city substantially the same with the invasive methods19,20, especially in assessing the no-reflow phenomenon in left anterior descending coronary artery (LAD), with fewer studies for left circumfl ex coronary artery (LCX) and right coronary artery (RCA) that occur with increasing technical performance in echocardiography5,21-25. Evaluation of risk factors of the no-reflow phenomenon in STEMI patients revascularized by primary coronary intervention, the no-reflow phenomenon being assessed by transthoracic Doppler echocardiography by determining the parameters of the flow in the coronary artery involved in the infarction. Prospective study of 131 patients with STEMI, who did not show on admission any electrocardiographic signs of necrosis, revascularized by primary percutaneous coronary intervention (PCI), performed in the Cardiology Clinic – Department of Interventional Cardiology of the County Clinical Emergency Hospital Braşov (SCJUBv) and in the Department of Interventional Cardiology of the Clinicco Hospital Braşov during 2010-2014. The patients were evaluated by clinical examination, resting ECG, transthoracic Doppler echocardiography(TTDE) and biological tests that included the serum levels of CK, CK-MB or TnThs. Clinical data recorded demographic parameters, cardiovascular risk factors, prothrombotic comorbidities such as concomitant acute infections, chronic inflammatory diseases (systemic lupus erythematosus, rheumatoid arthritis, infl ammatory bowel disease), haematological diseases (thrombocythemia) and documented history of ischemic heart disease. The STEMI diagnosis was made in the presence of chest pain of ischemic nature and ST-segment elevation on the ECG performed at the Emergency Room of the County Clinical Emergency Hospital Braşov (SCJUBv), according to the diagnostic criteria presented in the “Universal definition of myocardial infarction”28 and “Third universal defi nition of myocardial infarction”29. Serum levels of CK, CK-MB and TnT were determined in venous blood samples by spectrophotometry for CK, immunoassay for CK-MB and TnT on a Cobas 6000 device and its modules supported the diagnosis of values compliant with those generally recommended in the “Universal definition of myocardial infarction” 28. Cardiovascular risk factors were listed under the “ESC/EAS Guidelines for the management of dyslipidemia” 30, European Guidelines on cardiovascular disease prevention in clinical practice”31, and “Guidelines for the management of arterial hypertension”32. Arterial hypertension was considered starting with values >140/90 mmHg, obesity from BMI ≥30 kg/m2, dyslipidemia from LDL cholesterol levels >100 mg/dL.Resting ECG recorded 12 usual leads, right and posterior leads and was performed before and after PCI and 90 minutes after PCI on a Nihon Kohden Ecg-9022 device. Serum level of total cholesterol, LDL-cholesterol, HDL-cholesterol, triglycerides, glucose and creatinine were measured by standard enzymatic methods on a Cobas 6000 analyzer. Coronary angiography was performed with a Philips Allura FD 10 cardiovascular X-ray system in the Interventional Cardiology Department of SCJUBv and a Siemens Artis Zee Floor in the Inverventional Cardiology Department of Clinicco Hospital Braşov. Interventional revascularization was performed after an average time of 6.22 hours (1-72 hours) after the onset of ischemic pain by angioplasty and BMS stent implantation in 125 patients and thromboaspiration without stent in 6 patients. No protective devices of distal coronary embolization was used. Periprocedural treatment was started in the Emergency Room of SCJUBv or prehospital with acetylsalicylic acid 250 mg and clopidogrel 300 mg or 600 mg. High molecular weight heparin 100 U/kg was administered intraprocedural also depending on the evolution of the TIMIMBG score: eptifi batide iv, intracoronary thrombolysis, intracoronary nitroglycerin. At coronarography were assessed: the involved coronary artery and imaging characteristics of the obstructive lesion, lesions of other coronary arteries, TIMI fl ow grades before and after PCI, myocardial BLUSH grades (MBH) after PCI. Angiograms of coronary vessels were interpreted by two cardiologists of the interventional department, who participated in performing the interventional procedure. The no-reflow phenomenon was assessed by the flow parameters of the coronary artery involved in infarction, using Doppler transthoracic echocardiography (TTE), performed with Philips Sonos 7500 and Philips Affi niti 50G ultrasound systems on the seventh day after PCI in patients with TIMI 3 post intervention fl ow, in order to analyse the perfusion deficit in the coronary microcirculation that explains the post-reperfusion myocytic lesion1-5. The seventh day after PCI was chosen to assess the no-reflow phenomenon, when its reversibility decreases, an aspect with subsequent prognostic impact6, 7. Although the no-reflow phenomenon reflects a deficitary coronary microvascular perfusion, under conditions of epicardial flow restored after PCI in STEMI, TTE this is reflected in the epicardial artery by modification of flow parameters (described below), which is presented in angiography as TIMI 3 with Blush 0/115,21,23,25,27,33. Figure 1. TTDE – Colour Doppler: Left anterior descending coronary artery, middle-distal segment. Figure 2. TTDE – PW: Coronary flow with no-reflow velocity pattern. The transducer was used in the 3.5-5 MHz “second harmonic” frequency band for two-dimensional evaluation and 2-2.5 MHz for colour Doppler and pulse (PW) examination23,25,26. The sections used for transthoracic echocardiography (TTE) viewing of the coronary arteries, sections frequently modified (mode) compared to the standard one, were (according to Marek Krzanowski, Wojciech Bodzoń and Paweł Petkow Dimitrow, Cardiovascular Ultrasound 2003)23 for Left Main Coronary Artery (LMCA) / proximal Left Anterior Descending Coronay Artery (LAD):modified (mod.) parasternal short axis view (PSAX), mod. Parasternal long axis view (PLAX), mod. apical 5 chamber view (AP5C), mod. apical 3 chamber (AP3C) view, mod. subcostal long axis (SUB-LAX) view; for middle LAD: mod. PSAX view, mod. PLAX view, mod. AP5C view, mod. AP3C view, sigmod. SUB-LAX view; for distal LAD: AP3C view, mod. AP5C view; for proximal Left Circumflex Coronary Artery (LCX): mod. PSAX view, mod. PLAX view, mod. AP5C view; for middle LCX: mod. PSAX view, mod. PLAX view, mod. AP5C view; for distal LCX there are no well-standardized sections; for proximal Right Coronary Artery (RCA): mod. PSAX view, mod. PLAX view, mod. AP5C view; for middle RCA : mod. subcostal short axis (SUB-SAX) view; for distal RCA (Right Posterior Descending Artery (RPD)): mod. apical 4 chamber (AP4C) view, mod. apical 2 chamber (AP2C) view, mod. SUB-LAX view23. The transducer was used, according to other studies23, both at high frequencies, which provide an increased resolution for the two-dimensional mode and improves the sensitivity of the colour Doppler and PW examination, and at low frequencies, which provide a good penetration with higher Nyquist limits for the colour Doppler and PW examinations, to the detriment of a lower resolution and of a lower Doppler sensitivity23. Likewise, high frequencies were used for viewing apical structures, as well as distal LAD and low frequencies for RCA, LCX, proximal and middle LAD23. Use of the „harmonic” option for the two-dimensional mode has improved the quality of images23,26. The Nyquist limit used for colour Doppler was between 0.1-0.4m/s, reducing the area of the colour window to a minimum23,26. Doppler PW examination was performed at an angle of less than 60°, with sample width of about 3 mm23. Nyquist limit for PW was 0.15-0.25 m/s25,26. Normal coronary flow that can by highlighted through TTDE in the LAD, LCX, RCA and branches of coronary arteries show a biphasic, systolic and diastolic appearance that prevails, with velocities oriented in the same direction, for which measurements of speed, time of diastolic deceleration, velocity-time integrals, etc. can be performed23-27. TTDE diagnostic parameters for the no-reflow phenomenon, coronary flow (Figure 1,2), studied in literature especially at LAD level and less at LCX and RCA level, were: systolic velocity reverse ≥10 cm/s and duration ≥60 ms and diastolic deceleration time 40 years), 23 women over 40 years (18%) (F >40 years). The age of 40 years was chosen for distribution on subgroups given that myocardial infarction before 40 years of age is described as myocardial infarction of young people, with peculiarities of etiology, morphology of the coronary obstructive lesion, complications and prognosis34. The no-refl ow phenomenon was analysed in relation to age, gender, cardiovascular risk factors, prothrombotic comorbidities, previously documented ischemic heart disease, STEMI location, coronary artery involved in infarction and coronary angiography characteristics of the obstructive lesion. Statistical analysis used the IBM SPSS Statistics 20 program. Continuous variables with normal distribution were expressed as mean values and standard deviation, and categorical and ordinal variables were expressed as frequencies and percentages. Differences between two groups were assessed by the nonparametric Mann-Whitney U test, and between 3 or more groups by the Kruskal-Wallis test. Correlations between the no-refl ow phenomenon and various parameters were performed using Spearman bivariate correlation. Independent predictors of the no-reflow phenomenon were determined by multivariate logistic regression. The level of statistical significance was set at p.
Average age of STEMI patients was 49.47+/14.23 years (21–86 years). In patients under 40 years of age, the average age of men was similar to that of women [(35.97+/-4,51 years) vs (38.14 +/-3.29 years)] and in patients over 40 years of age, the average age of men was significantly lower than the age of women[(50.57+/-11.49 years) vs (67.78+/-9.99 years), (p<0.001)]. The average time from the onset of the fi rst pain of ischemic nature until the performance of the primary angioplasty was of 6.22 hours in the entire group of patients, noticeably equal for men and women under 40 years and significantly higher in women over 40 years compared to the mane of the same age group (p=0.002) (Table 1) and in men over 40 years compared to those under 40 years (p=0.002). The frequency of arterial hypertension was significantly higher in men compared to women under 40 years and noticeably equal for men and women over 40 years. Diabetes mellitus significantly more frequent in women over 40 years was noticeably equal in terms of frequency in men and women under 40 years. The frequency of dyslipidemia and smoking did not vary significantly in men and women in the two age subgroups, the dyslipidemia being signifi cantly more frequent in patients over 40 years compared to those under 40 years. Previously diagnosed ischemic heart disease (IHD) was recorded significantly more frequent in women over 40 years compared to men in both age subgroups (p=0.001). Prothrombotic favourable conditions were significantly more frequent in women compared to men in both age subgroups (Table 1). Myocardial infarction was considered anterior and anterolateral, if the ST-segment elevation appeared in anterolateral leads, inferior to the right ventricle, if the ST-segment elevation appeared in the inferior-lateralposterior leads or in the right precordial leads. There were no significant differences of the anterior or inferior location of STEMI between men and women of the two age subgroups (Table 1). Coronary angiography revealed a more frequent involvement of LAD in STEMI in patients under 40 years and RCA in patients over 40 years (Table 1). Thrombotic obstruction of the coronary artery involved in STEMI has been reported in >1/2 of patients under 40 years, significantly more frequent among them compared to patients over 40 years, with no differences between men and women of the two age subgroups. Obstruction by a thrombus on atherosclerotic plaque was found in approximately 1/3 of patients under 40 years and in >1/2 of those over 40 years, being significantly more frequent in women over 40 years compared to men under 40 years and in men over 40 years compared to those under 40 years. Coronary obstruction predominantly caused by atherosclerotic plaque was identified in approximately 1/4 of patients, in a noticeably equal proportion between men under 40 years and women and men over 40 years, this type of lesion has not been reported in women under 40 years (Table 1). The frequency of the no-reflow phenomenon diagnosed by TTDE in the coronary artery involved in STEMI was: 27.5% in the whole group of patients with STEMI and revascularization by primary PCI, 43.4% in women over 40 years, 38.7% in men under 40 years and 20% in men over 40 years. The no-reflow phenomenon was significantly more common in men und 40 as compared to those over 40, and in women over 40 years compared to men over 40 years. The study of the correlation between the no-reflow phenomenon and the artery involved in infarction showed that it was significantly positively correlated with the anterior location of STEMI and obstruction of LAD, both in men under 40 years and in men and women over 40 years (Table 2). The no-reflow phenomenon was positively correlated in men over 40 years with the presence of dyslipidemia, previously documented ischemic heart disease, multivessel affectation and obstruction predominantly by atherosclerotic plaque of the coronary artery involved in infarction (Table 2). 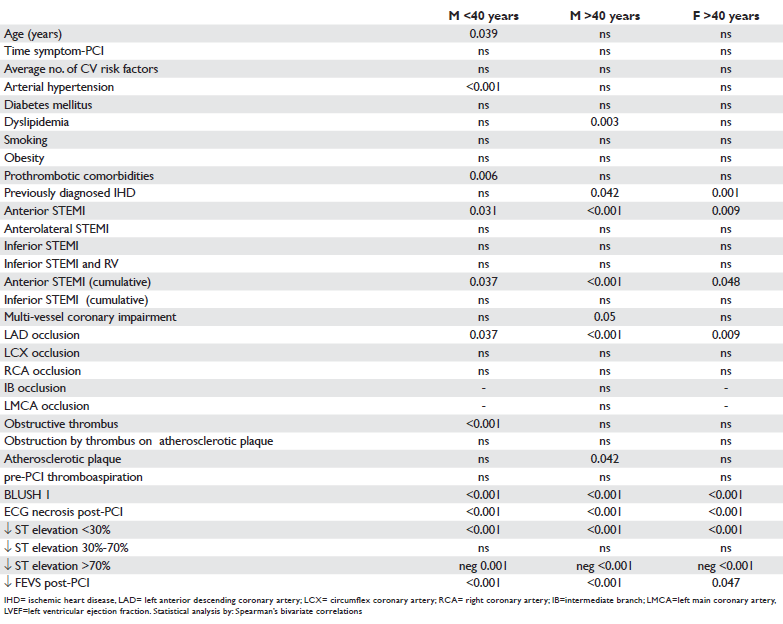 In men under 40 years there has been a positive correlation of the no-reflow phenomenon with arterial hypertension, prothrombotic comorbidities and obstruction by thrombus of the coronary artery involved in infarction, and in women over 40 years with the previously documented ischemic heart disease (Table 2). 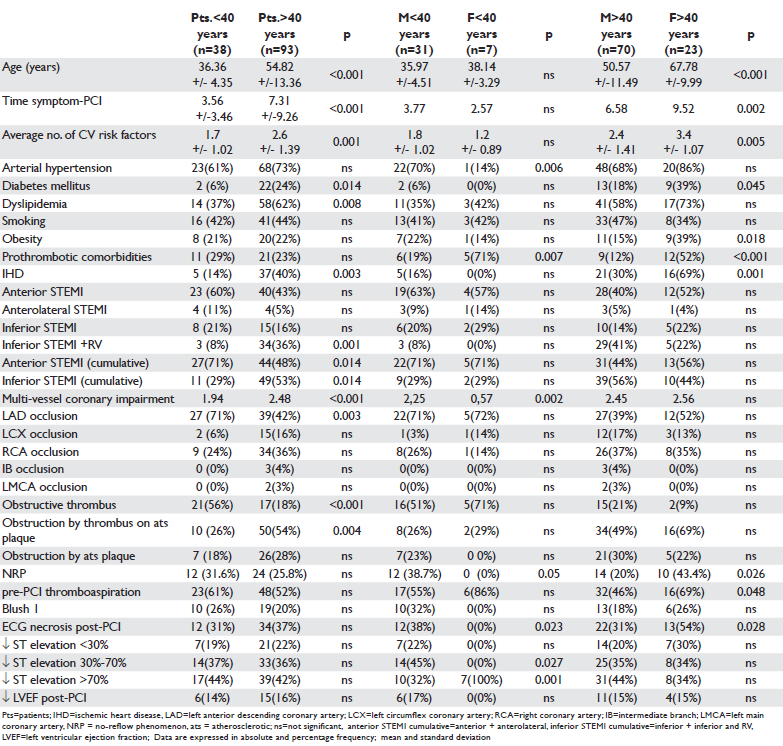 In all patients the no-reflow phenomenon correlated with the occurrence of necrosis and reduction below 30% of the ST-segment elevation on the ECG performed after primary PCI (Table 2). By applying the multivariate logistic regression method the following were identified as independent predictors of the no-reflow phenomenon: anterior localization of STEMI and prothrombotic comorbidities in both men under 40 years and in those over 40 years, arterial hypertension in men under 40 years, dyslipidemia in patients over 40 years, diabetes mellitus, smoking and association of previously diagnosed IHD with cardiovascular risk factors in women over 40 years (Table 3). The relatively important frequency and negative prognosis of occurrence, persistence and refractoriness to treatment of the no-reflow phenomenon on the evolution post revascularization in acute myocardial infarction with ST segment elevation6,35,36 has boosted the evaluation of potential risk factors in order to identify subgroups of patients with indication for prophylactic therapy, and there are studies showing that the reversibility of the no-reflow phenomenon reduces the risk of death after myocardial infarction6. The frequency of the no-refl ow phenomenon in patients with STEMI and primary interventional revascularization, assessed in this study by resting transthoracic Doppler echocardiography of coronary arteries was 27.5% and falls within the values reported in literature6,9,16,36. Reported frequency of the no-reflow phenomenon after acute myocardial infarction is of 2 – 50%, variations are due to the type of revascularization, diagnosis technique and time from onset of ischemic pain until coronary revascularization5,37,38, its frequency being reduced by shortening the time from onset of infarction until achieving coronary revascularization6,16,38. In our study that evaluated STEMI patients, who showed ST segment elevation without Q-wave on admission electrocardiogram, the mean time value recorded since the fi rst pain of ischemic nature until primary PCI was 6 hours. The appearance in this study of the no-refl ow phenomenon more common in women over 40 years (43.4%) is consistent with finding a higher frequency of this phenomenon in patients over 65 years with STEMI and revascularization by primary PCI39. As in other studies, women over 40 and STEMI presented themselves significantly later than men for determining the diagnosis of infarction40, aspect that may be involved in increasing the frequency of the no-reflow phenomenon in this subgroup of patients. their use being followed in some clinical reports by reduction of the procedural myocardial infarction rate and no-reflow phenomenon rate48,49. The no-reflow phenomenon assessed by fl ow velocity parameters in the coronary artery involved in the infarction, obtained by transthoracic Doppler echocardio graphy, occurred in approximately 1/4 of STEMI patients revascularized by primary PCI and was also positively correlated, regardless of age and gender, with the anterior location of STEMI on ECG, LAD obstruction, coronary obstruction by a thrombus in young men and by atherosclerotic plaque in men over 40 years. Intervention of arterial hypertension, diabetes mellitus, dyslipidemia, smoking and prothrombotic comorbidities in the occurrence of the no-reflow phenomenon appear to be modulated by age and gender. The subgroup of women under 40 years and STEMI was not a statistically significant sample to be included in the assessment. Acknowledgements: This study was made possible with the support of the medical teams in Cardiology Clinics and in the Interventional Cardiology Department of the Clinical County Emergency Hospital Braşov and in the Interventional Cardiology Department of the Clinicco Hospital Braşov, whom we are addressing our acknowledgements in this way. 1. E. Eeckhout, M. J. Kern. The coronary no-reflow phenomenon: a review of mechanisms and therapies. European Heart Journal 2001; 22:729-739. 2. Derek M. Yellon, D.Sc.,Derek J. Hausenloy. Mechanisms of disease myocardial reperfusion injury. N Engl J Med 2007; 357:1121-1135. 3. Kloner RA, Ganote CE, Jennings RB. The “no-reflow” phenomenon after temporary coronary occlusion in the dog. J Clin Invest 1974; 54:1496-1508. 4. Kloner RA. No-refl ow revised. J Am Coll Cardiol 1989; 14:1814-1815. 5. Adrian Iancu, Camelia Ober, Horaţiu Cadiş, Radu Hagiu, Lucian Zarma, Alexandra Lazăr, Andreea Pârv. Sindromul obstrucţiei microcirculatorii din infarctul miocardic acut. In Progrese în Cardiologie. Ed.Dan Deleanu. Media Med Publicis, Bucuresti, 2010; 37-59. 6. Dan Deleanu, Irina Modavu, Lucian Zarma, Marian Croitoru, Adrian Bucşa, Pavel Platon, Rami Chreih, Marin Postu, Carmen Ginghină. Impactul caracterului tranzitor al fenomenului de no-reflow asupra prognosticului pacienţilor cu STEMI revascularizaţi prin PCI. Revista Română de Cardiologie 2007; Vol. XXII; 1:7-14. 7. Resnic FS, Wainstein M, Lee MK et al. No-refl ow is an independent predictor of death and myocardial infarction after percutaneous coronary intervention. Am Heart J 2003; 145:42-46. 8. Ndrepepa G1, Tiroch K, Fusaro M, Keta D, Seyfarth M, Byrne RA, Pache J, Alger P, Mehilli J, Schömig A, Kastrati A. 5-Year Prognostic Value of No-Refl ow Phenomenon After Percutaneous Coronary Intervention in Patients With Acute Myocardial Infarction. J. Am. Coll. Cardiol. 2010; 55:2383-2389. 9. Alessandro Durante, Paolo G. Camici. Novel insights into an “old” phenomenon: the no refl ow. International Journal of Cardiology 2015; 187:273-280. 10. Gibson CM, Cannon CP, Daley WL, et al. TIMI frame count. A quantitative method of assessing coronary artery fl ow. Circulation 1996; 93:879-888. 11. Christoph Bickel, H.J. Rupprecht, A. Maimaitiming, I. Welk, S. Blankenberg, F. Krummenauer, J. Meyer. The Superiority of TIMI Frame Count in Detecting Coronary Flow Changes After Coronary Stenting Compared to TIMI Flow Classifi cat. [Online] Journal of Invasive Cardiology. http://www.invasivecardiology.com/ ; 2002; Vol. 14; 11. 12. Van’t Hof AWJ, Lief A, Suryapranata H, et al. Angiographic assessment of myocardial reperfusion in patients treated with primary angioplasty for acute myocardial infarction. Myocardial blush grade. Circulation 1998; 97:2302-6. 13. The TIMI Study Group. The thrombolysis in myocardial infarction (TIMI) trial. N Engl J Med 1985; 312:932-936. 14. Svilaas, Tone, Vlaar, Pieter J., van der Horst, Iwan C., Diercks, Gilles F.H., de Smet, Bart J.G.L., van den Heuvel, Ad F.M., Anthonio, Rutger L., Jessurun, Gillian A. Tan, Eng-Shiong, Suurmeijer, Albert J.H., Zijlstra, Felix Thromb us Aspiration during Primary Percutaneous Coronary Intervention. N Engl J Med 2008; 358:557-567. 15. Santoro GM, Valenti R, Buonamici P et al. Relation between ST segment changes and myocardial perfusion evaluated by myocardial contrast echocardiography in patients with acute myocardial infarction treated by direct angioplasty. Am J Cardiol 1998; 82:932-937. 16. Thorsten Reffelmann, Robert A Kloner. The”no-reflow” phenomenon. Basic science and clinical correlates. Heart 2002; 87:162–168. 17. Michael Ragosta, Gustavo Camarano, Sanjiv Kaul, Eric R. Powers, Ian J. Sarembock, Lawrence W. Gimple.Microvascular Integrit Indicates Myocellular Viability in Patients With Recent Myocardial Infarction. New Insights Using Myocardial Contrast Echocardiography. Circulation. 1994; 89:2562-2569. 18. Manivannan Srinivasan, Charanjit Rihal, David R. Holmes, Abhiram Prasad. Coronary Intervention: Impact on Microvascular Perfusion and Outcomes Adjunctive Thrombectomy and Distal Protection in Primary Percutaneous. Circulation 2009; 119:1311-1319. 19. Lee S, Otsuji Y, Minagoe S, Hamasaki S, Toyonaga K, Obata H, Takumi T, Arimura H, et al. Correlation between distal left anterior descending artery fl ow velocity by transthoracic Doppler echocardiography and corrected TIMI frame count before mechanical reperfusion in patients with anterior acute myocardial infarction. Circulation Journal 2005; 69(9):1022-8. 20. Lee S, Otsuji Y, Minagoe S, Hamasaki S, Toyonaga K, Negishi M, et.al. Noninvasive evaluation of coronary reperfusion by transthoracic Doppler echocardiography in patients with anterior acute myocardial infarction before coronary intervention. Circulation 2003; 108(22):2763-8. 21. Iwakura K, Ito H, Takiuchi S, et al. Alternation in the coronary blood fl ow velocity pattern in patients with no refl ow and reperfused acute myocardial infarction. Circulation 1996; 94:1269-75. 22. Antti Saraste, Juha W Koskenvuo, Markku Saraste, Jyri Toikka, Alexandru Naum, Heikki Ukkonen, Juhani Knuuti, Juhani Airaksinen, Jaakko Hartiala. Coronary artery fl ow velocity profile measured by transthoracic Doppler echocardiography predicts myocardial viability after acute myocardial infarction. Heart 2007; 93:456-457. 23. Marek Krzanowski, Wojciech Bodzoń, Paweł Petkow Dimitrow et al. Imaging of all three coronary arteries by transthoracic echocardiography. Cardiovascular Ultrasound 2003, 1:16. 24. Alla Boshchenko, Alexander Vrublevsky, Rostislav Karpov, Baskot Branislav. Transthoracic Echocardiography in the Assessment of Coronary Arteries. Coronary Angiography – Advances in Noninvasive Imaging Approach for Evaluation of Coronary Artery Disease. InTech. 2011; 21:61. 28. Kristian Thygesen, Joseph S. Alpert, Harvey D. White et al. Universal defi nition of myocardial infarction. ESC/ACCF/AHA/WHF. European Heart Journal 2007; 28:2525-2538. 29. Kristian Thygesen, Joseph S. Alpert, Allan S. Jaffe, Maarten L. Simoons, Bernard R. Chaitman, Harvey D. White et al. ESC/ACCF/AHA/WHF Third universal defi nition of myocardial infarction. European Heart Journal 2012; 33:2551-2567. 30. Zeljko Reiner, Alberico L. Catapano, Guy De Backer, Ian Graham, Marja-Riitta Taskinen, et al. ESC/EAS Guidelines for the management of dyslipidaemias. European Heart Journal 2011; 32, 1769–1818. 31. Joep Perk, Guy De Backer, Helmut Gohlke, Ian Graham, Zeljko Reiner, W.M. Monique Verschuren, Christian Albus et al. European Guidelines on cardiovascular disease prevention in clinical practice (version 2012). European Heart Journal 2012; 33:1635-1701. 32. Giuseppe Mancia, Robert Fagard, Krzysztof Narkiewicz, Josep et al. 2013 ESH/ESC Guidelines for the management of arterial hypertension. European Heart Journal 2013; 34:2159-2219. 33. Montisci R, Chen L, Ruscazio M, et al. Non-invasive coronary flow reserve is correlated with microvascular integrity and myocardial viability after primary angioplasty in acute myocardial infarction. Heart 2006; 92:1113-8. 34. Wang Yunyun, Li Tong, Liu Yingwu, Liu Bojiang, Wang Yu, Hu Xiaomin, Li Xin, Peng Wenjin and JinFang Li. Analysis of risk factors of ST-segment elevation myocardial infarction in young patients. BMC Cardiovascular Disorders 2014; 14:179. 35. Morishima I, Sone T, Okumura K, Tsuboi H, Kondo J, Mukawa H, Matsui H, Toki Y, Ito H, Hayakawa T. Angiographic no-refl ow phenomenon as a predictor of adverse long-term outcome in patients treated with percutaneous transluminal coronary angioplasty for first acute myocardial infarction. J Am Coll Cardiol 2000; 36:1202-9. 36. Ito H, Maruyama A, Iwakura K et al. Clinical implications of the ‘no refl ow’ phenomenon: a predictor of complications and left ventricular remodeling in reperfused anterior wall myocardial infarction. Circulation 1996; 93:223-8. 37. Iwakura K, Ito H, Nishikawa N, et al. Early temporal changes in coronary fl ow velocity patterns in patients with acute myocardial infarction demonstrating the “no-refl ow” phenomenon. Am J Cardiol 1999;84:415-19. 38. Turschner O, D’hooge J, Dommke C, Claus P, Verbeken E, De Scheerder I, Bijnens B, Sutherland GR. The sequential changes in myocardial thickness and thickening which occur during acute transmural infarction, infarct reperfusion and the resultant expression of reperfusion injury, Eur. Heart J. 2004; 25:794-803. 39. Hua Zhou, Xiao-yan He, Shao-wei Zhuang, Juan Wang, Yan Lai, Weigang Qi, Yi-an Yao, Xue-bo Liu Clinical and procedural predictors of no-reflow in patients with acute myocardial infarction after primary percutaneous coronary intervention. World J Emerg Med 2014; 5(2):96-102. Boer. Is the difference in outcome between men and women treated by primary percutaneous coronary intervention age dependent? Gender difference in STEMI stratified on age . European Heart Journal: 2013; 2:4334-341. 41. Iwakura K., H. Ito, S. Kawano, Y. Shintani, K. Yamamoto, A. Kato, et al. Predictive factors for development of the no-reflow phenomenon in patients with reperfused anterior wall acute myocardial infarction, J. Am. Coll. Cardiol. 2001; 38:472-477. 42. Maria Olszowska, Wiesława Tracz, Magdalena Kostkiewicz, Piotr Podolec. Predictive factors of myocardial reperfusion in patients with anterior wall acute myocardial infarction Cardiology Journal 2008; 15(1):57-62. 43. Skyschally K, Leineweber P, Gres M, Haude R, Erbel G, Heusch, Coronary microembolization, Basic Res. Cardiol. 2006;101:373-382. 44. D. Opherk, G.Mall, H. Zebe, F. Schwarz, E.Weihe, J.Manthey, et al., Reduction of coronary reserve: a mechanism for angina pectoris in patients with arterial hypertension and normal coronary arteries. Circulation 1984; 69:1-7. 45. Iwakura K, Ito H, Ikushima M, Kawano S, Okamura A, Asano K, Kuroda T, Tanaka K, Masuyama T, Hori M, Fujii K. Association between hyperglycemia and the no-refl ow phenomenon in patients with acute myocardial infarction. J Am Coll Cardiol. 2003; 41(1):1-7. 46. Gjin Ndrepepa, Klaus Tiroch, Dritan Keta, Massimiliano Fusaro, Melchior Seyfarth, Jürgen Pache, Julinda Mehilli, Albert Schömig, Adnan Kastrati. Predictive Factors and Impact of No Refl ow After Primary Percutaneous Coronary Intervention in Patients With Acute Myocardial Infarction. Circulation: Cardiovascular Interventions 2010; 3:27-33. 47. Julian Gagliard, Jorge Syarfer,Carolina Travetto,Gerardo Gigena, Andreea Rodriguez, Analia Alonso, Rodrigo Blanco, Federico Blanco, Ricardo Sarmiento, Miguel Ricitteli. Clinical predictors of no-refl ow in percutaneous coronary Intervention for acute myocardial infarction. Rev Argent Cardiol. 2013; 81:222-227. 48. G Sangiorgi, A Colombo. Embolic protection devices. Heart 2003; 89:990-992. 49. Limbruno U1, De Carlo M, Pistolesi S, Micheli A, Petronio AS, Camacci T, Fontanini G, Balbarini A, Mariani M, De Caterina R. Distal embolization during primary angioplasty: histopathologic features and predictability. Am Heart J. 2005; 150(1):102-8.